Richard got in touch with us a few weeks back in regards to his interest in having a personal website designed. 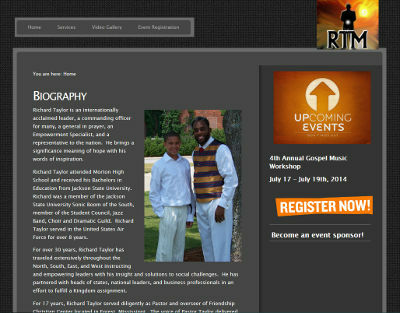 Richard provides musical instruction and mentoring services to church choirs and also has events each year. We worked with Richard to get a copy of his logo, his biography, and the information regarding his upcoming event in July and put everything together. We also created a registration form, setup PayPal integration for the form, and even made a page that has several videos that he provided us. Thank you for your business, Richard, and we look forward to updating your website each time you have a new event! Richard’s site is at richardetaylormusic.com.